Ever wondered How to be a corporate/soft skills trainer and what makes a good trainer? 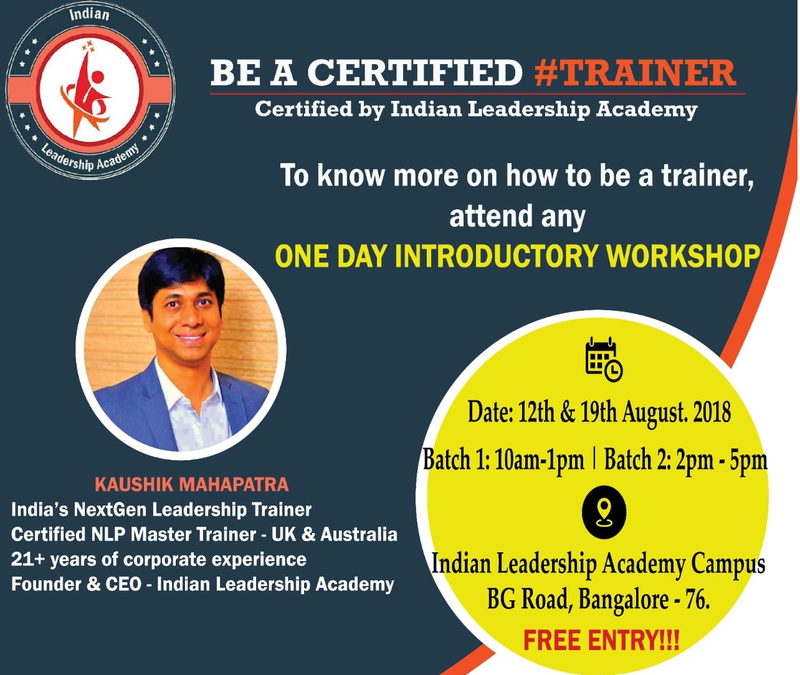 Indian Leadership Academy gives you an opportunity to attend a FREE ONE DAY INTRODUCTORY WORKSHOP to get an outline of the Train the Trainer Certification. This workshop is a 3-hour session with a realistic demonstration of the examples of the current trends in the Training and Development Industry. How do you market yourself as a trainer using Digital Marketing? There is no certification provided for this introductory workshop. Kaushik Mahapatra is one of the leading, most dynamic leadership trainers and motivational speaker in India. People call him Indias next-gen leadership trainer/coach. He has a completely different training and public speaking style. He uses humor, Arts, music, storytelling and many other fun based approaches in training and public speaking. IIM Lucknow Alumni with 20 Years of experience with- HP, GE, and Wipro. He has Worked in India, US, UK, Australia. Certified NLP Practitioner, PMI ACP, Six Sigma, CSPO, CSM. Rich experience in Training, Coaching, L&D, IT Delivery, Sales, and operations. His work on Leadership development for youth has been exceptional. NLP, Leadership Essentials for Managers, Train the trainer, Effective presentation skills, Listening skills, Design Thinking, Agile, Six Sigma, Corporate Strategy, Team building, Young Entrepreneur, Family workshops, leadership development programs for youth.